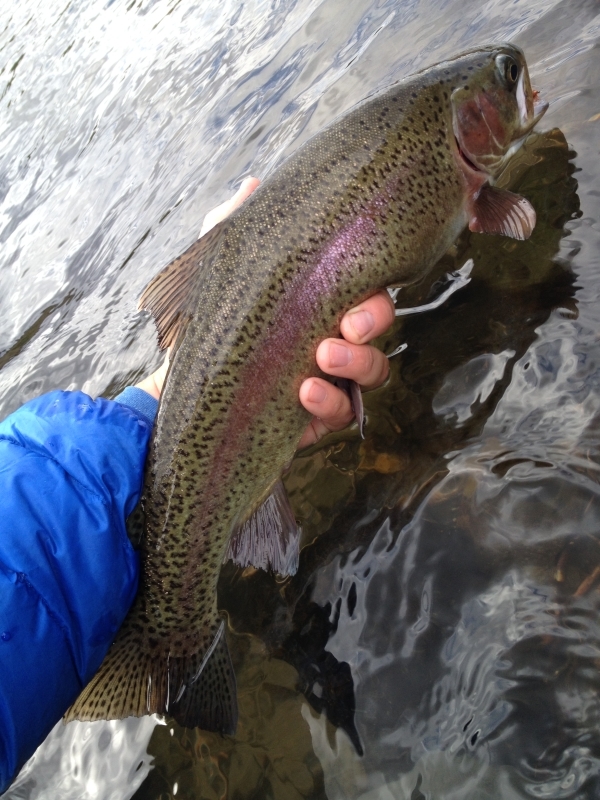 A wonderful East Branch Rainbow thanks to Ben Rinker. Well I have finally acclimated to the west coasts current weather conditions, after a super fun week out east in upstate New York. It rained everyday I was in NY, big changes coming home to a heat wave. It was a major change as I think the hottest it got back east was 70, the day I got back home 104…big change. Spey Nation was great, love the river and love doing the event. Seems to be a little better every year too. 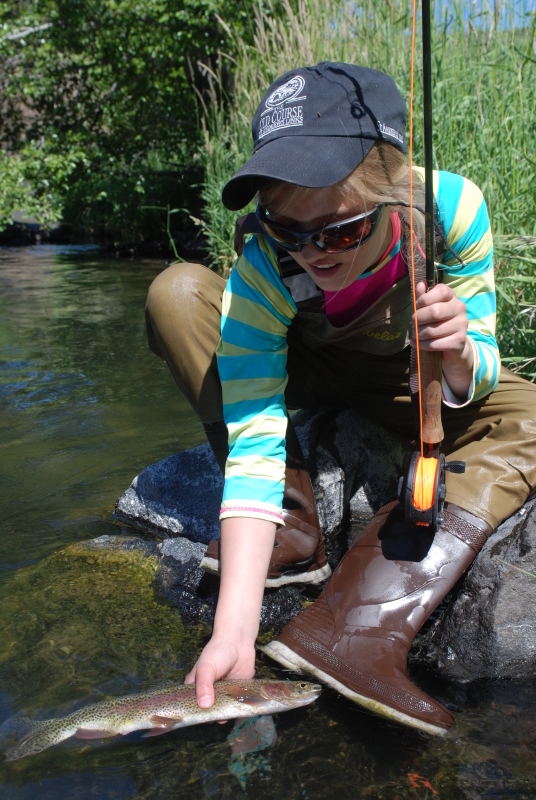 the Addition of the Tailwaters Lodge is also great for Spey Nation and the Salmon river. If your ever up there, stop in and check the place out, foods good too. 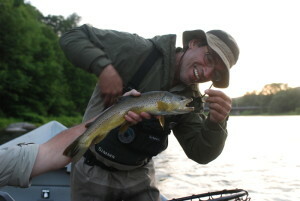 Patrick with a dandy Brown trout!! As for the rest of the trip I got to do some fishing!!! I do like to toss a fly now and again. A big thanks needs to go out to Patrick Ross, Ben Rinker, and Jamie Perry. These boys showed me a great time!!! 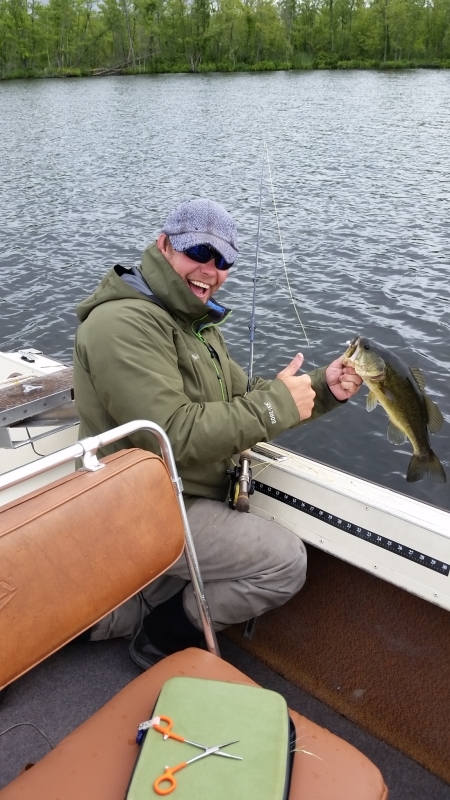 Anybody who gets anytime fishing with these guides is sure to feel the same way. The Delaware was a great river both branches, Ben Rinker is the man for either venue, don’t hesitate to look up East Branch Outfitters. Jamie Perry the warm water specialist got us into some sweet water and even better fish, took a few species off the bucket list, thanks brother. What else can you say about good old Patrick Ross, Great Host and great guy. 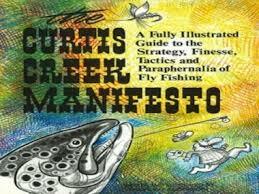 If you are looking for the best swing only guide on the Salmon river for Steelhead look no futher!!! he is the man. Now, it must say with not a lot of joy that my home water looks like mud!!! this heat wave has caused the white river to be a silt spewing trickle. We can only hope that the cool weather to come firms things up there a bit and brings the reality of steelheading closer. 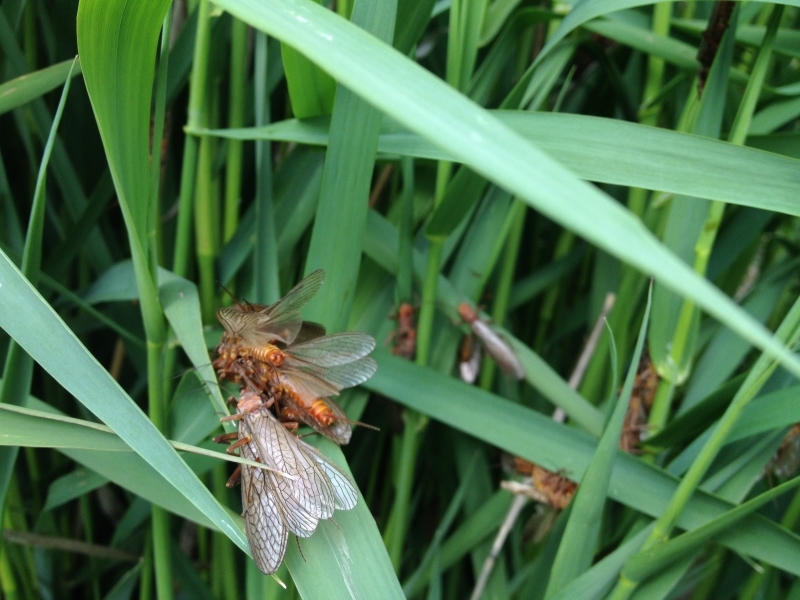 Trout fishing has been solid and caddis are the fly of choice, eddies and happening and spent bug are doing the trick, stay about the white for cooler, and clearer water!! If you are thinking about getting out with AWA this fall for a steelhead float better contact us now as things are getting full and we dont want you to miss out! thanks for reading. Not a monster but a sweet fish, we had other follows and looks at the big ones! 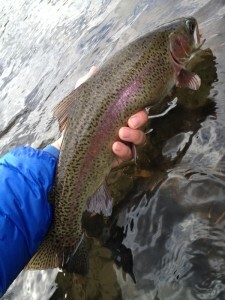 Hold more fish like this one with a few helpful hints. Read on!!! I know many, many things have been written about becoming a better trout angler. 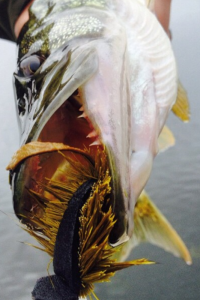 I do feel compelled to write a few things on the topic because as a guide I see things that most anglers do on a regular basis. The fly fishing industry claims that the average angler nation wide fishes 10 days a year. If that’s even close to true, most anglers need to read more often so they can formulate sound plans for the few days they get to be on the water. 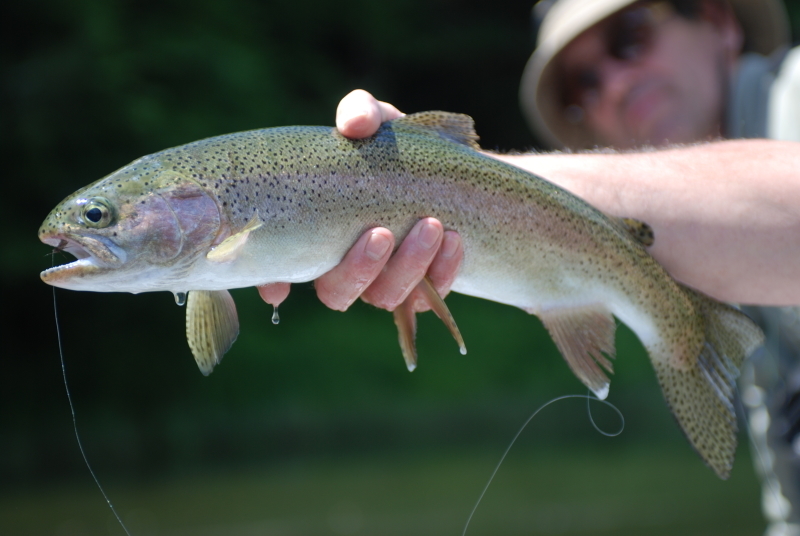 You don’t need to be an experienced angler to follow good trout fishing protocol. I have made a list of some of the top mistakes or misunderstanding I see from being a guide and that are easily corrected. This is not picking on anybody, I just want my readers to become better and in so catch a few more good fish. So here we go. Great read, and full of easy to gain knowledge. STUDY: If you cant be on the water, you can learn about your local fishing waters. There are so many online resources for rivers now a days it should not be hard to find something about your local fishing spot. Studying about you waters is not always about the fish. learning things like flow patterns, and insect hatches can be really helpful. 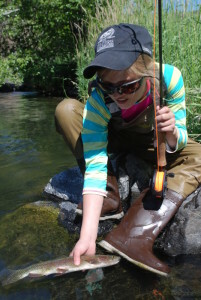 Studying the history of the area can even lead to breakthroughs in locating fish. Point in case, while reading about the construction of the railroads along the Deschutes river, I learned that many places where they blasted the path way for the track sub-grade rock were shot into the river. These new placed forms of structure made lots of new habitat for the local redside trout, and places for myself and sports to find fish!! Dont have to be real observant to see whatb the trout are eating here. OBSERVANT: One of the biggest on water mistakes or just misunderstanding is being observant… Or maybe just where and how to look. 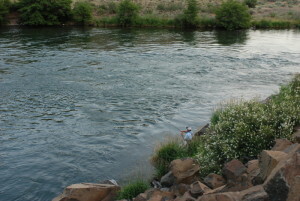 The Deschutes River is big water! Trying to look at the river in its entirety is hard to really see what happening, but start looking at the water around you. Fishing the water closest to you breaks the water down. don’t look where you can’t cast to watch closer, move slowly. You will be really surprised at what you have passed by in the past and the fish you will start catching that live in their own microcosms. The factor of becoming more observant to the things in the water around you, but really watching how the fish you are casting to behave. Noting the differences in the actions of some fish may help reveal what they are feeding on. Consistently taking trout like this takes patience. Sometime numbers can never out weigh quality! PATIENCE: With the first two points fitting in nicely with this one, it becomes a bit self explanatory. Remember you are on the fishes clock, they are not on yours. So if the weather of conditions dictate that trout fishing will be good between 8-11 am and again from 6-9 pm, be ready then. 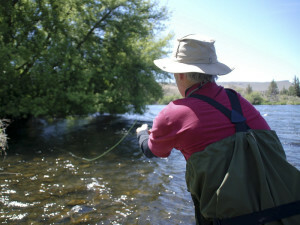 Fishing during hours that fishing is not very good wont help with ones time spent on the river. The other side of this coin is, once you have found a good trout and you want to get him it may take a bit of patience too. 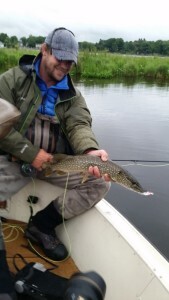 I have fished with lots of anglers and can tell you the angler that takes his time and stays calm can get most fish. A great place to cast to a fat redside below a tree. 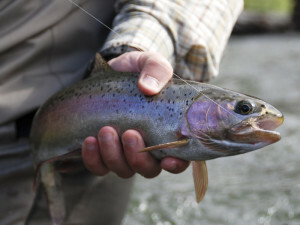 POSITION: Now that you have studied your fish and patiently watched and observed what the trout was eating, finding the best angle or place to cast from is the next step in a good battle plan and carries just as much importance as any other of the components of becoming a good trout angler. Some fish you find the answer will be straight forward, others will take some thought and this is where the chess match begins. On my waters the most common position is behind the fish. 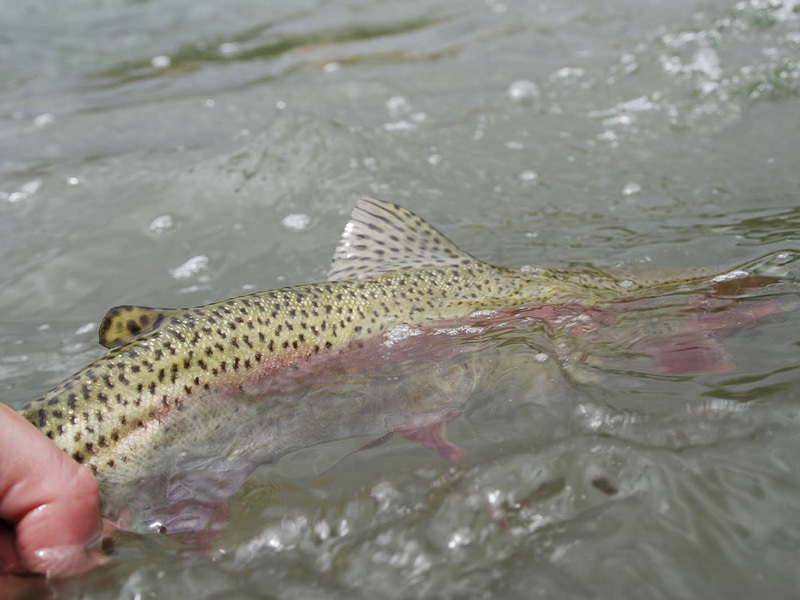 Trout have 270 degree field of view and one big blind spot, that’s right behind them. 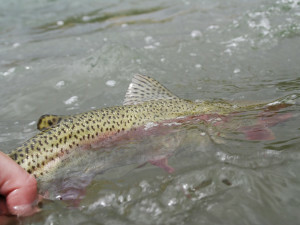 On most of the spring creeks I have fished from the best shots were quartering up to the fish from behind them. Some fish make that perfect situation unavailable. so them we have to be smart and take extra care to find the next best position. Accuracy helped to take this hot redside!! sometimes one good cast is better than 30 average ones. ACCURACY: I know that most of us want more distance in our casts. I know that for sure as a distance caster. 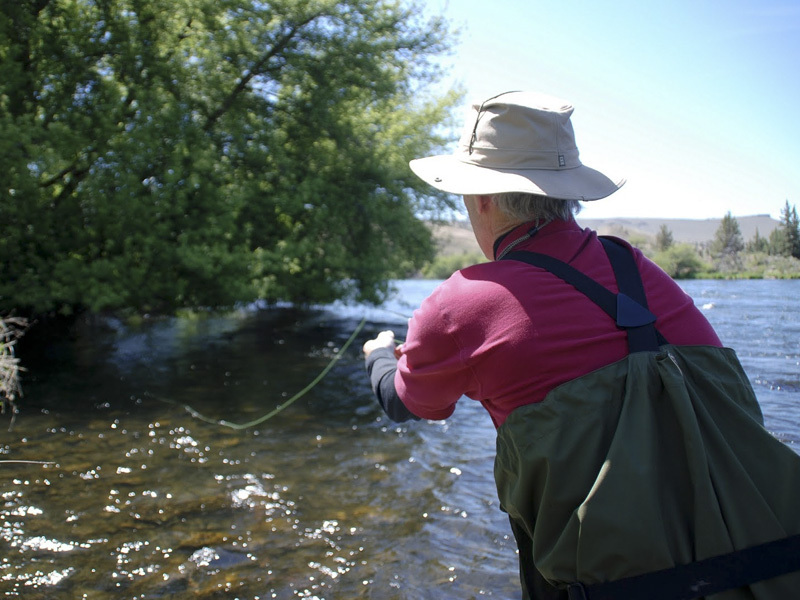 In 99.999% of all trout angling situations accuracy will be more sought after than distance. That said most flats fishing is about accuracy, maybe more from 40-70 feet. I believe that someone who practices 1 day a week on making accurate cast from 20-30 feet will improve their trout catch rate immensely. So get out in your yard, or the street, the local park, or even your local river and practice. Hope you all get out and find a few like this one!! Just a heads up Spey Nation is in 2 weeks I still have a few openings in the Sunday class. If anyone is interested shoot me an email. I am excited to be there!! Cant wait to see you all again.